There are thousands of Americans teaching English abroad in dozens of countries around the globe like Spain, Italy, and Argentina. What do 90% of them have in common? In addition to enjoying the international adventure of a lifetime, they are teaching English “under the table.” In other words they are not legally working in those countries with a work visa. This is commonplace, even routine, in dozens of countries around the world, but it is not technically legal. The first matter is to understand that there are different types of visas that you will use to teach English abroad and that regulations vary from country to country. Please refer to our article, "What is a visa and do I need a visa to teach English abroad?" What does it mean to teach English abroad “under the table,” without a work visa? You don’t have official permission to work in that country. You are officially working illegally. You probably entered the country where you are teaching on a tourist visa (in many countries a tourist visa will enable you to stay legally in the country for 90 days) and in many cases, you will stay on and teach English on a tourist visa that has expired or lapsed (this will be the case in countries like Italy and Spain where tourist visas cannot typically be renewed). In such cases, you are not only working illegally, but you do not have a valid visa to legally be in that country either. In other cases, such as Argentina, you can renew your tourist visa or get a new one before your original visa expires (example day 85 of your 90 day visa), often by leaving and re-entering the country. You won’t sign a legal, binding contract. You won’t receive benefits like national medical insurance. Why don't schools offer me a work visa in some countries? The government in each country will maintain different policies regarding issuing work visas to foreign English teachers - some make it difficult or impossible; others make it a routine process. For political or economic reasons, many countries (including the U.S.) make it difficult for foreigners to live and work legally in that country. Many governments simply don't have a policy of processing work visas for foreign English teachers, or they make it extremely difficult, expensive and/or time-consuming. In other countries there is a clear process that foreign English teachers can follow to gain a work permit or a work visa. Example: Germany (an EU country) offers work visas to Americans for teaching English, and while it can be time-consuming, the process is pretty straight forward. In Spain (another EU country) the government has not implemented a process by which foreign, non-EU English teachers can get a work visa unless they are employed directly through a government program. Yet, thousands of Americans and other foreigners teachg English in Spain every year with no work visa without incident. Both are EU nations but each maintains different policies and processes when it comes to visas for English teachers. Money and Time: In some countries like Argentina it may take 6 to 12 months to get a visa processed and the cost of processing a work visa may equal 3-6 months' worth of wages. In addition the process may include an incredible amount of paperwork and bureaucracy. 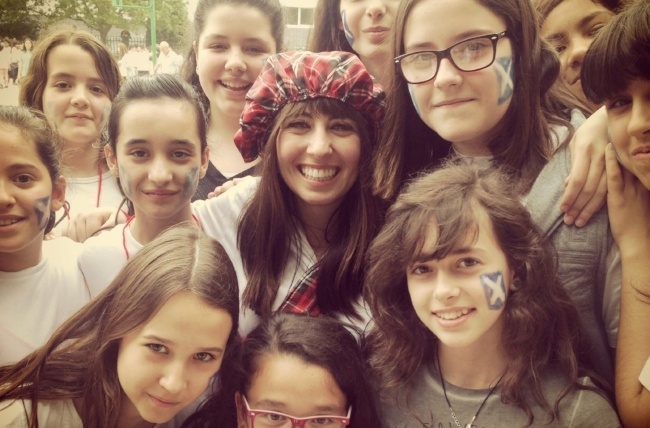 Argentinian schools just are not going to pay that type of money nor can they wait that long for a work visa when the teacher may be gone in 6 months anyway. If a school had an easy and affordable way to help you get a work visa they would. In light of that, it's common in high demand countries to just work under the table. But if it’s illegal, why are so many people teaching English abroad “under the table” and why do schools hire them? Thousands of schools worldwide are in high need of qualified (TEFL-certified) teachers. Many schools prefer to hire Americans or Canadians because demand for North American dialects is extremely high. The bottom line is English language schools are in business to make money, the American dialect is what students want to pay for and the schools want to hire Americans and other foreign English teachers regardless of work permits. Americans and others teach English “under the table” because schools will hire them and pay them enough to make a decent living wage that enables them to pay their rent, cover their living expenses and to enjoy life in the country where they teach. Risk to both the school employing the teacher and the teacher is very low. Thousands of Americans and other foreigners teach English abroad in dozens of countries without a work visa, and only a minute percentage ever get in any trouble over it; the same goes for the schools hiring them. Schools would not hire American English teachers under the table in places like Italy, Spain, Argentina, etc. if it presented a serious threat to the viability of their business. Authorities in these countries just aren’t spending their time looking for American English teachers; they are far more concerned with actual criminals and illegal immigration from Africa and the former Soviet republics. It is important to note that in many countries, a very high percentage of the economy generally is “underground” and not legally sanctioned by the government. According the New York Times for example, approximately 20% of Spain’s entire economy is completely unregulated, so it’s not just English teachers who are technically working illegally. In many countries where Americans teach English “under the table,” native English speakers are almost never asked to produce a visa to authorities once they have arrived in that country. They are living there just like any other tourist going about their daily life. The big question: Will I get in trouble and what happens if I get caught teaching English abroad without a work visa? If schools and teachers routinely got in trouble with authorities for employing and working under the table, then nobody would do it. In truth, only a minuscule percentage of English teachers working in nations like Spain, Italy, and Argentina ever get into any trouble at all, but in most countries teaching English without a work visa is illegal and there can be consequences. Other European countries such as France, Switzerland, and in Scandinavia are less likely to hire under the table, it's important to know which countries will hire and which countries do not. Our advising staff will give our expert opinion and give you the bad news along with the good news about the country prior to registering for a TEFL class. 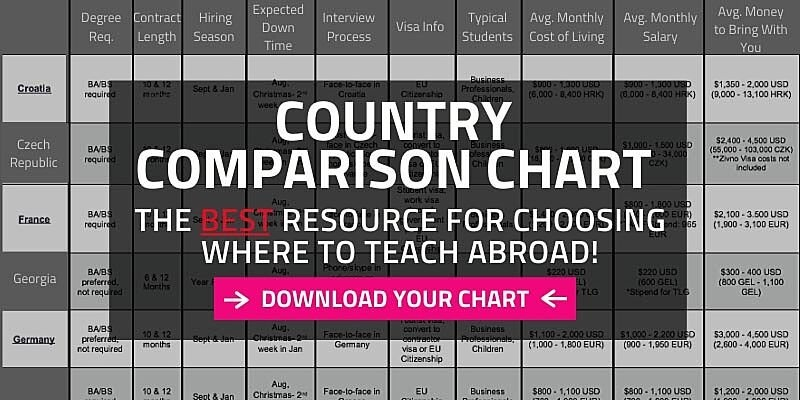 TIP: Download a Country Chart to see which countries where schools employ English teachers on a tourist visa & which countries offer the possibility of an official work visa. Potential penalties vary from country to country. Typically, somebody who is caught by authorities overstaying their tourist visa and/or working without a work visa or work permit may be subject to modest fines and/or deportation. In some cases they may be banned from re-entering that country for a period of time. In a nutshell, if you are caught they will probably put you on a flight back to your home country right away and just get rid of you (they aren't looking to pay money to put you in jail, just get you out of the country). The language school may have to pay a fine. For some schools this is just the price of business that they are willing to pay in order to have qualified teachers that their students want. What if I only want to teach in a country legally with a work visa or work permit – is this possible and if so where? Europe - Russia, Turkey, Germany, and Czech Republic are major European nations where most English teachers obtain work visas. American English teachers participating in government teaching programs in France, Spain and the Republic of Georgia also receive work visas and in many European nations, including France, Spain and Italy, those on student visas also have a right to work. Canadians, and often Australians and New Zealanders who meet certain criteria can get working holiday visas for many European nations that allow them to work as English teachers as well. Citizens of the U.K. and Ireland are not required to obtain any work visa as they have automatic working privileges throughout the European Union, though they may need to fill out residency and tax forms. Please review International TEFL Academy’s Working Holiday Visa Chart to learn more about where it may be possible for you to receive a working holiday visa to teach English abroad. Latin America - The vast majority of Americans teaching English in Latin America do so with no work visa, but in Chile and Mexico a high percentage of English teachers do receive visas, and in Costa Rica, foreign English teachers can receive a tax number and permission to earn income even though they are in the country on a tourist visa. The Middle East – Receiving a work visa is the norm for English teachers in Persian Gulf countries like Saudi Arabia, the U.A.E, and Qatar, while in other Arab countries like Egypt, Jordan and Morocco, most teachers do receive work visas, but some teachers work “under the table” as well. The key is to conduct your research and to consider carefully your options and know your options. Check out dozens of articles about all aspects of visas & documents for teaching English abroad. * Legal stuff: International TEFL Academy is an American based company with over 5,000 new graduates a year. We understand all the questions and concerns Americans and foreign teachers have about teaching in countries that do not offer work visas. While we cannot condone breaking an official law, we do believe in explaining the cultural norms of each country and what is realistic & practical and not practical in finding English teaching jobs abroad. Ultimately it is your choice to decide where you teach English abroad and how you do it, and we will provide you expert advice and an honest perspective of what is realistic and not.